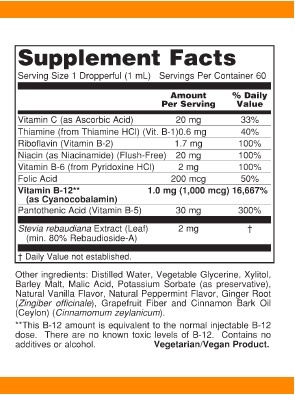 Home > Vitamins & Supplements > Liquid Vitamin B-12 Complex - 2 oz. FormaGenix unique Liquid Vitamin B-12 formula is a water-soluble vitamin necessary for the maintenance of a healthy nervous system and for the metabolic utilization of fats and proteins. B-12 is involved in the metabolism of every cell of the human body, especially affecting DNA synthesis and regulation, but also fatty acid synthesis and energy production. As a dietary supplement, in the morning, take one dropper-full, hold in mouth for 30 seconds, then swallow. To supplement your Diet or Simeons weight loss protocol, use 1,000mcg daily for increased energy. 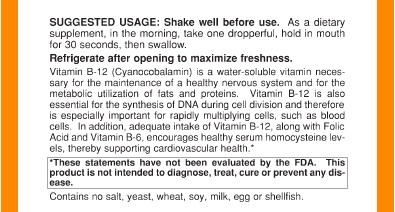 FormaGenix Liquid Vitamin B-12 Complex should be stored at room temperature away from direct light. I like the b-12 and the customer service of this company is excellent. Shipped really fast.